The house is situated on a residential estate andprovides accommodation for 4 tenants, each having a good sized bedroom with en-suite facilities. The communal areas are all furnished to a high standard with a kitchen, lounge and large maintained garden. The town of Ashford is quite large and, as such, there are many community amenities, two large shopping complexes and a cinema. 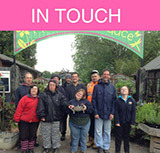 Tenants are supported and encouraged to be part of the local community and use the facilities. Getting around - There is a daily bus service to Ashford and from there bus and train services to London / Canterbury / Dover / Ramsgate and Hastings. In addition to, and separate from, the Tenancy Agreement, COT Community Support Services can provide a tenant with assistance in their daily living activities and provide skill development and Life Skills opportunities. Where a tenant requires this service COT will agree with them an individually tailored Care Agreement.